So after probably 3 months of anxiety about having to travel to ‘the sunnier Blackpool’ I had a brilliant time, with old and new friends. So I’ve put together a small Do’s and Dont’s list for those who are yet to travel to the Seaside City. 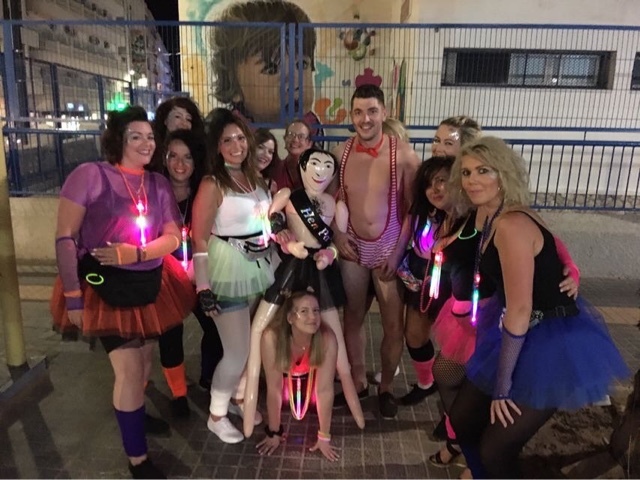 It’s known for groups of Hens and Stags, so get involved and dress up like nobody’s watching. If you take a short walk to the old town there is an amazing alley filled with tapas bars and it is seriously wall to wall. Enjoy the amazing food. I have travelled far and wide but I would say that Benidorm Beach and Sea is seriously one of the best. It’s really clean and the sea is very very clear. Not a pebble or seaweed in sight. I’m a pure lover of the TV series Benidorm so it was a must to see it in really life. Just at the top of the strip it sits and boy it’s busy so be prepared. With live acts to the early morning it’s pure class! Ok so I mentioned that you should visit Tapas Alley, yes you most definitely should but we over egged how much we would receive. It’s not La Tasca it’s proper tapas (Who would of thought, being in Spain) and the portions are like more like meals. So when we ordered over 13 dishes between 6 of us we were a little bit over faced. We travelled to the sunny city in October and it was still very warm, so be advised air conditioning is still required even for an autumnal break. So I’m not a huge fan of ice in vodka drinks, why because it waters down the Coca Cola. But Benidorm don’t really do measures so when you get almost 3 quarter glass full of random vodka with only a top up of Coke be advised its not pleasant.